This movie was about an artist that went by the name of "Someguy" who had an idea to send out 1000 blank journals for the world to fill in and send back to him. 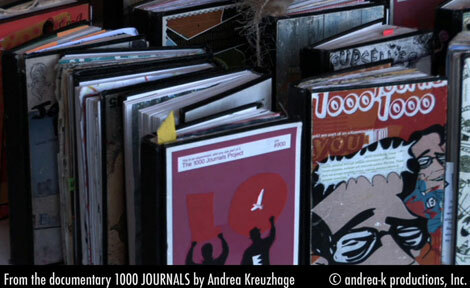 The idea was really neat and it was cool how far each journal can travel. I can only imagine what it was like to be the artist to be the one that work so hard to customize each cover and send them out in random places. I would be really curious to where each book would end up and what kind of person is keeping it. This idea is very similar to the one I knew of called "Post Secret" where another artist sent out blank post cards for people to write their secrets on anonymously and send them back to him so he could publish them collectively in a book as well as post them on a blog site. I also recall another similar idea that I participated in when I went to the San Diego Museum of Art in Balboa Park, where an art student left an empty scroll and a whole bunch of writing utensils for people to write whatever they felt like on that scroll. The whole feeling of all three ideas make people feel connected to random strangers from across the world. I like it and I hope that maybe I would find a journal or a postcard somewhere to write and draw in.